What do we want a child to feel and experience in a classroom? An aesthetically and well planned environment influences a child’s development positively in all areas; social, emotional, physical and cognitive. It is important for a learning environment to be intentionally designed and the areas well-defined for the child to self-navigate. Upon entering a classroom, a child must see how they can interact with the environment without an adult making choices for them. This fosters self-regulation. A child begins to know what his or her preferences are and that they are valued within the framework of the classroom. When a child feels a kinship within the environment they naturally take ownership in their learning journey, building confidence and independence. The atelier at EtonHouse Pre-School Mountbatten 223 is set up with a variety of areas that supports a child’s need for a range of experiences and encourages children to be inquisitive learners . Sensory activities are essential for young children and are considered a building block of art exploration. This area is usually stocked with sand or water, along with different prompts to add variety or a theme. 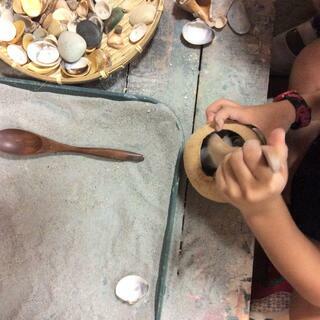 For instance, by adding sea shells, the children’s exploration is given a push in the direction of natural environments. This provides an opportunity for children to add on to their pre-existing knowledge of the natural world. 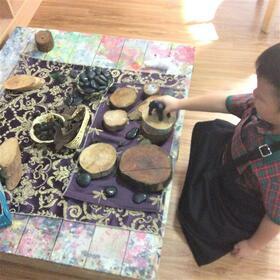 This initial stage is useful for the teacher, to listen and gather information about the children’s inquiries. The teacher can then add more specific information and prompt them to extend their learning. 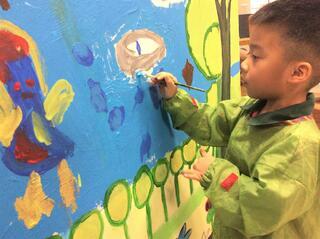 Painting is one of the core activities that a child can choose to do when they enter the art atelier. Besides being fun, painting also helps a child develop critical thinking skills. Children can learn about cause and effect, with hands-on experiences. Every action creates a new set of circumstances to navigate. Thick paint, runny paint, color choice, brush size and paper orientation, are the set choices built into the activity. How the child navigates within these choices is self-initiated. Engaging in the process of painting has the potential to imprint critical thinking skills and children learn to tolerate frustration and find solutions. These skills are a necessary foundation for the developing mind. Our clay area is stocked with throwing wheels, trimming tools and glazes. Interestingly, one of the byproducts of manipulating clay is storytelling. 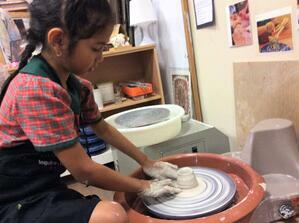 When children create with their hands, a narrative often accompanies the play. Clay stories, as told by the children, are rich material for the children to form ideas, process the ways in which the world works and develop understanding of themselves. 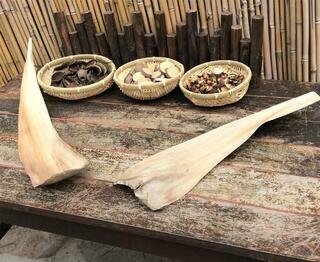 A variety of open ended parts is available, mostly in the nature and sensory areas. These include: beads, caps, tubes and rocks (to name a few). Materials that require a child to use their imagination or their experiences result in sustained play. A block that is shaped and painted like a tree is more likely to be played with as a tree. However, a simple wooden block can be transformed into many things. When children apply their experience to other contexts, it demonstrates a flexible learning disposition. A collection of natural materials - seed pods, rocks, tree rings and flowers - is provided for children to see and interact with Nature. Children use their innate sense of curiosity and begin to think critically about the world around them. The rings seen in a slice of wood or the patterns of a leaf can inspire many observations and questions. This area is an extension of our garden. Investigation of the natural world helps a child develop a sense of stewardship with the environment. “Research shows that those children with a sense of place are also more likely to turn their love of one place into a love for all of nature; this creates a sense of empathy with the natural world,” shares Melissa Harding, Phipps Science Education Specialist. Visit EtonHouse Pre-School Mountbatten 223 and immerse in our lovely learning spaces. Take our survey and let us know what topics you'd like to see on our blog! Kim Fitzharris is from Seattle Washington. She studied painting and drawing at The University of Washington and proceeded to work as an art teacher in early childhood education. By offering an open ended approach in art she has seen children blossom. She believes the emphasis is on the experience rather than the end product. In her free time Kim spends her weekends in the ceramic studio. Passionate about clay and wildlife she creates animal sculptures with all proceeds donated to animal welfare charities.